Ryan’s Case for Smiles is one the few volunteer organizations solely dedicated to helping kids feel better to heal better. While other great organizations focus on research and finding a cure, they work to improve the quality of life of children and their families as they undergo treatment. Ryan’s Case for Smiles (formerly ConKerr Cancer) was founded in 2007 to bring comfort and support to young patients and their families in hospitals around the globe. They started with a simple goal: to create and distribute whimsical pillowcases that give children an emotional boost and remind them that they are not defined by their illness. Today, our programs have expanded to include the children’s entire family so they can better navigate and cope with a very difficult experience and avoid long term emotional trauma. The Dallas/Fort Worth Chapter is coordinated by Jan Moher. 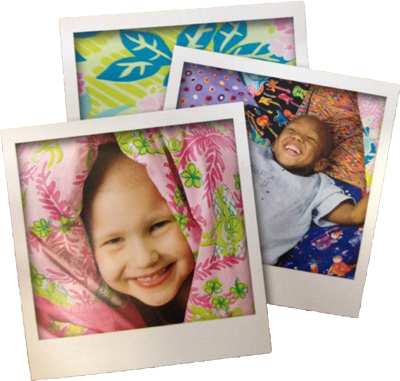 Our chapter provides pillowcase smiles to Children's Medical Center of Dallas, Children's Medical Center at Plano, and Medical City Children's Hospital in Dallas. Happiness Is . . . Quilting! is one of the drop off sites for the Dallas/Fort Worth Chapter. Funds to help us purchase supplies and expand the effort! Please mail checks to Happiness Is ... Quilting!, 217 N. Kentucky Street, McKinney, Texas 75069, and specify the funds are to be used for pillowcase materials for Ryan's Case for Smiles.